Does God have a 6000 year plan for man to rule himself before Jesus comes to rule for 1000 years, to fulfill the six work days and Sabbath day of the week given to Israel? Article: What’s Next In Prophecy & What’s Holding It Back? Whatâ€™s Next In Prophecy & Whatâ€™s Holding It Back? Yesterday I posted to my Facebook that Michael Rood was coming to visit me at my home. I did so to give friends a chance to post questions they would like me to ask Michael. In response I had quite a few questions, some of which I was able to ask and will cover in this article. I’ve known Michael Rood for ten years, almost as long as I have been living in Costa Rica. He came to Costa Rica in the Spring of 2000 and it was posted on his website (the old 6001.com). This was when he was on the Prophecy Club hosted by Stan Johnson and promoting his groundbreaking Spring and Fall Feasts of the LORD video tapes. A bunch of us went to the hotel advertised for where he would have a get together and he never showed up. Not a great start to a great relationship. We missed him that time but we soon hooked up and invited him to stay at our home as he explored TV opportunities in Costa Rica.Â He visited a few times in 2000 and 2001 and even wrote some of the original A Rood Awakening TV script at our home. In 2002, when he announced his first tour of Israel, we considered it. Katrina and I had never been to Israel and to go with someone who would take you to Gomorrah where you could mine your own brimstone was hard to resist. We put down the deposit and my employer promptly cut my hours and then laid me off completely. I was short $5000 for the trip and had no way of paying it. Yet Michael and his then partner Jamie decided to let us go anyway and pay the balance when we could afterward. Needless to say, we had a blast for eleven days touring Israel with them. I met Nehemia Gordon and made some discoveries as a result of the tour that later ended up in my book (such as the Elijah insight). In fact, this visit from him is the first one since his ministry problems a few years back. I put Michael Rood in a whole different category. While not being judgmental I feel it is important before you believe, follow ones teachings, or just read and study their materials you need to research this person. Their are many false prophets and teachers out there. I have serious reservations about Michael Rood. I completely understand these sentiments and do not judge the person for feeling uncomfortable with Michael. I used to have similar ones for teachers, even including Michael himself when some of the events of recent years came out and hurt even my own friends and associates. However, in recent years I have gained some perspective that helps me to embrace Michael for his good and the good he does and let go of the bad. We have had people live with us a lot in 2008 and 2009. If you have ever tried living with people for an extended period, you quickly have problems come up. Oftentimes you are the cause of the problem. If you are aware and teachable, you have to face the fact that you are not perfect and you do things that at best are less than effective and at worst annoying, insensitive or offensive to others. From this, I see that I am really not much different than Michael or anyone else. We all are a mixed bag. We all have limited experience that leaves blind spots in our awareness leading us to make choices that hurt others. Yet nearly all the time, we are well-intentioned and feel justified in what we do. I have not asked Michael, but I have no doubt he felt justified in what he has done that has hurt others and feels justified in what he does and says today. This is summed up in a quote I have heard from him a few times over the decade I have known him. He likes to say with a smile, â€œYou know, I do not teach anything that I believe to be false….Think about that a minute.â€ In other words, people can accuse him of being a false prophet or leading people astray but in reality he is only teaching what he is sincerely convicted of from his personal diligent study. I can relate to that as I do the same thing. Yet every time I send out a newsletter, I get unsubscribe notifications with comments accusing me of purposely misleading people. People do not have the experience needed to realize that yes people can come to different conclusions on the Bible than they have and yet be good sincere diligent truth seekers like themselves. The Bible is just that way (on purpose, as I cover in my book). By the same token, I do not censor him completely just because he has said or done things I disagree with. And, by the way, some might be happy or surprised to know that Michael Rood has been reaching out to reconcile with the people he has had his public controversy with. He has apologized to a friend of mine and now they are going to work together again in the future on A Rood Awakening, a definitely mutually beneficial reconciliation and relationship. I hope my comments can help some of you to withhold judgment on our brothers just as Jesus/Yeshua said. We do not know what is in their heart and usually we do not know all the facts, or even both sides of the story. Someone like Michael Rood who goes out every day trying to wake people up from their religious trance cannot be all bad. He is still learning and always has a much to share that I find worth listening to, ten years later. Now on to the questions and answers promised. Q. Is The 2010-2017 Timeline Still Viable? A. His answer was that he has not ruled it out yet, however he reminded me that there is something yet missing for it to happen: global economic collapse. See, just as I teach, he does not see the attack on Israel that results in Damascus getting nuked being able to happen the way things are today. He believes that America has to be neutralized from being able to help Israel, leaving her isolated. Seeing this, the Arabs would have an opening to attack and fulfill Zechariah 12, Isaiah 34, and other parallel prophecies. Q. Is Damascus’ Destruction Expected This Fall? A. I did not get to ask him this directly, but what he said was â€œDamascus could be nuked as early as nine months from nowâ€. He is referring to a fulfillment in the Hebrew month of Tishrei, 2010, which is the month the 70th Week of Daniel begins (and ends, seven years later). This is what he calls the Confirmation of the Covenant. He has been waiting for this event to kick off the final seven years for as long as I have known him. Thus, the answer is that Damascus’ doom is not â€œexpectedâ€ as much as it is â€œpossibleâ€. I presume he would expect it only if a global economic collapse happened this spring or summer. Some of you may have seen that in recently years Michael Rood has been sick and even in a wheel chair. That is all we knew ourselves due to our lack of contact. Yesterday we finally heard the skinny on his illness. It started with his trip to Rwanda. After coming back he started to have problems with pain in one leg. He had to pile on ice to keep the pain down in his hotel room. Next he had to be in a wheel chair. He was meeting people later with the same symptoms that was labeled as â€œGulf War Syndrome.â€ The problem was that none of them including Michael had been in the Gulf War! Then he kept seeing families with autistic children who last time he saw them the kids were fine. In each case, the children went bad right after vaccinations. Then Michael remembered that he himself had just had vaccinations for a recent trip to Rwanda that preceded his whole health decline. It will not surprise readers that he does not approve of the swine flu/h1n1 vaccination. He related stories he had heard of pregnant women having dead babies taken out of them after receiving the h1n1 vaccine. Needless to say, Katrina and I enjoyed our visit. We honestly did not expect him to ask to see us this time with how busy his schedule usually is. That felt very nice. He shared some great insights as you can see. I look forward to seeing Michael again and helping each other in our passion for teaching the truth (as we understand it) to truth seekers like you my readers. Are We The “Last Generation”? Hey Tim I got one more question. We are 100% sure we are in the last generation right? If this is true then do you have any idea how long a generation actually is? It seems like no one has a clear cut answer. Ive heard 40, 50, 70, but no one really knows. Answer: Actually there is no “last generation” described in Scripture. That concept came from a popular misapplication of the Parable of the Fig Tree (Mt 24:32-35).Â This view posits that the thing to watch is the fig tree (Israel) putting forth leaves (take Jerusalem) and that “this generation shall not pass until all is fulfilled” refers to the people alive when the fig tree does this still being alive when Jesus returns. If this were true, then again we’d have a calculation for the absolute single time of Jesus’ return far in advance which contradicts what he expressly said about the impossibility of no man knowing the time (“day or hour”) of his return (Mt 24:36). This is the reason all such calculations have failed throughout history: Jesus said they never will work since even he the Son of God (and the entire Word of God) does not know. The Bible is just a subset of the Word of God and so we can never use it to figure out Jesus’ return (further in advance than 1290 days from the Abomination of Desolation probably). In truth, the Parable of the Fig Tree does not refer to Israel at all. It tells us to watch for “all these things” that the Olivet Discourse listed as the precursors to his return. Just as seeing leaves on any tree (not just a fig treeâ€”Lk 21:29) tells you summer is nigh, so do all these events happening tell you Jesus’ return is near. Read Mt 24 to see what all those things listed are. Ironically, none of them match Jerusalem getting return to Israel and instead one of them is Jerusalem taken from Israel by the Antichrist (Lk 21:20)! Now that you know it won’t help you figure out the Second Coming’s timing, do you still want to know the length of a biblical generation? It’s established at 40 years from more than one precedent (Heb 3:9-10; Ps 95:10). Sign up for my free newsletter for a series on the Seven Prophecy Pitfalls that discusses this in more detail. Gaza War: 70th Week or Psalm 83 Near? In the paragraph preceding â€˜The Revelation Roadmapâ€™, you state that it is already too late for the next cycle. I realize that this was written/printed prior to the start of this latest Gaza conflict. Given the current events in the Middle East and the possibility that this could end up developing into the first entry youâ€™ve described in your timeline, Iâ€™d like to know your thoughts on the issue. Also, any other thoughts on current US economic stability? Or the upcoming president Obama? It’s not simply a matter of one nuke. The Arabs need an arsenal and the capability of delivering it reliably. And these are not a few extremists we are talking about like religious fanatical suicide bombers. Psalm 83 talks about all the governments of Israel’s enemies joining together in a united attack on Israel. They are not going to make such a suicide attack and trigger the Samson Option unless they have some hope of winning through their own option. There is a very good reason that the Arabs have not done an unified attack since 1967 and 1973 to wipe out Israel and threaten her existence. It was rumored in those wars they prepared their fledgling nuclear stockpile to retaliate against the Arabs. Their first bomb produced had “never again” inscribed on it. That’s what the nukes are doing for them and will continue to do as the Arabs know Israel will use them on their capitals if they have nothing else to loose. Of course I could be wrong and only time will tell. But in my experience this Gaza action is nothing new and not enough to end the 45 year quiet from the Arabs trying to do what they have desired since day one in 1948. As for US stability, I addressed that in the new last chapter already that we can only expect the US to recover as she always has from economic setbacks because of what Revelation 18 predicts about her continued hegemony on the day she falls. Regarding Obama, in the next free newsletter (to be posted here for those who have not subscribed yet) I will address why he cannot be the Antichrist. Sign up here or below if you have not already. Hope this answers your question. And thank you for reading my book. If you have been waiting for my prophecy insights newsletter to begin regular updates since the day you subscribed (probably months ago), then good news….the wait is over. 1. What Happened to all the Newsletters in 2007? So, what happened to all the newsletters you signed up for? More than a few have asked me about this, wanting to be sure there was not something wrong with their email or sign up. The answer is that my many planned newsletters never made it out of my head and into your inbox for lack of time. It’s not just that I had major deadlines with my Bible software programming client of nine years last year. On top of that my website and forums began to increase in traffic and sales, including of my new softcover edition which went through two printings in 2007. I went from biking to the post office a couple times per week to having to go every weekday (which has had the additional benefit of insuring I get enough exercise). So I was effectively working two jobs in 2007. But as they say, it’s a good problem to have. Anytime you start a business in your spare time and weekends, you hope that it grows to the point that it can replace your regular income. But as it does, you have a period of too much work until you can transition out of your job. I’m just about there, having given notice with my client who are now looking for a programmer replacement. Since I take days to put each together each newsletter to ensure that they are worth your time, I ended up putting none out. I apologize for that and thank you for waiting patiently as I know how it feels to not be able to discern all the predictions and prophecies out there. The good news is with programming work nearly behind me, you will be able to hear from me regularly. I plan regularly put out this newsletter, create a DVD version of Know the Future and, of course, more books. There is even a possibility of getting on TV soon. * Is the USA or its dollar or economy ready to fall? Find out why not. * Is a Middle East War near? * How can you tell a real prophet of God today according to the Bible? Stay tuned so you don’t miss out on these coming articles that will help you get past your confusion over what the Bible says and be able to use that Biblical knowledge to discern the truth. The most popular doomsday date approaching is 2012. Countless sites offer evidences from various sources including Bible Code, Peak Oil, Numerology, Remote Viewing, Elliot Wave, etc. as evidence of something earth-shaking due that year. Most famously 2012 is the year when the so-called Long Count b’ak’tun cycle of the Mayan Calendar ends (on December 21 or possibly December 23). While it’s unclear what the end of that period meant to the Mayas, many interpret the period end as The End, perhaps of civilization as we know it due to a major catastrophe, such as the passage of Planet X. 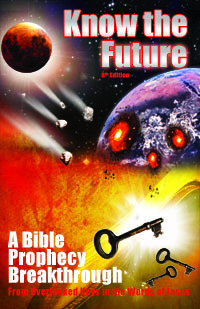 Continue reading this article here: 2012 doomsday? Will Israel Launch the First Nuclear Attack Since WWII? Iran’s president shows no signs of relenting, of course he’s a religious fanatic who wants an apocalypse to bring in the Mahdi. I think in a few years Iran and her allies will attack Israel per Psalm 83. I still am not sure if the mentioned preemptive strike on uranium enrichment facilities will trigger the Arabs as a counter attack or if Israel will have to scratch that and go for the hitting of the capitals like Damascus as a counter strike in defense. Either way, many bible prophecies indicate this war is coming, perhaps before the end of this decade. Already Past 6000 Years Since Adam? I enjoyed reading your article 6000 Year Timeline. I did a similar study but came to a different conclusion. I am using this email to share my findings with you because I believe they can help us both. I counted the geologies from when Adam & Eve were expelled to the end of the Old Testament to come to 4,167 years or the 4th day since Adam & Eve’s expulsion. Jesus Christ appeared on this earth 2006 years ago which when added to the 4,167 comes to 6,173 years since Adam & Eve’s expulsion. Since 1 day is 1,000 years to God this would be day 6. It’s important to understand that this day 6 is not over! I don’t know when it will be over but I can tell you it wouldn’t be any longer than 827 years. Jesus said the generation that sees what he describes in Matthew 24, Mark 13, and Luke 21 would not pass away. I think you’d agree these things are happening now so we are the generation that is going to see those things. This means that since a generation lasts around 100 years maybe, this is just a guess the end is 82 years away? Thanks for comment and question. Well, you may want to check your assumption that Jesus came 2006 years ago in 1 BCE. Most place it much earlier and my own conclusion based on the Star of Bethlehem (as you read if you signed up for my newsletter) is 3 BCE. More importantly, the 7th millenial day starts at 6,001 years from adam’s rule, not 7,001 (since the 1st day is 0001 to 1000, 2nd 1001 to 2000, etc.). If we are already 6173 years from adam’s rule as you contend, then there obviously is a problem since Jesus’ rule should have begun 172 years ago. Most place Jesus coming much earlier than you do, perhaps around 3999 or 4000 years from creation, placing it at the end of the 4th millennial day from creation, just as the sun came forth on the 4th day of creation week (see Eugene Faulstich’s chonology). Also, I’ve never heard anyone give a definition of a biblical generation that could possibly fit 100 years. The biblical generation seems to be just like we define it today, a few decades it takes for one to grow and raise children of their own. It’s not a lifespan, which is still much less than 100 years. 2nd Hour.mp3 Get the book from the interview here.or read all about it here. Gary m on How Long is the Great Tribulation: 7 years or 3½?The seven yrs comes from Danile 9 versus 24 to 26 when the Angel Gabriel speaks to Daniel. Obiajulu Echedom on Why God Likes You More Than You ThinkOh! Such a lovely description of our relationship with our heavenly father. Thanks a lot. Joel on When Elijah Comes, What Will He Be Wearing?That didn't work out as planned, or has there been an adjustment in the prophecy that I wasn't notified about?